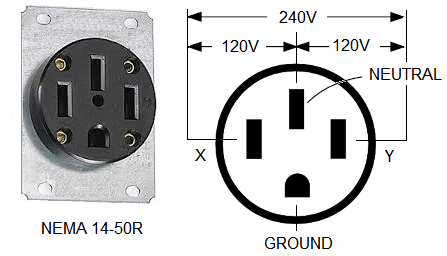 This 3-pole 4-wire 50-amp straight blade style socket is common for most high-power (10kW and greater) portable generators. It provides 120/240V and is rated to 12.5 kVA maximum. In reality, if you follow NEC® and UL 80% derating guidelines, you can get up to 240x50x0.8= 9,600 volt-amps assuming you balanced the loads on X and Y. The mating plug 14-50P should fit conductors #6 AWG. Connect red and black wires to X and Y, white to Neutral and green to Ground (see the diagram above). Note that some commercially available cords provide a thinner green lead (such as #8), which may be acceptable since the ground conductor does not carry the load current.